In 2009 Holiday Island resident and Eureka Springs Independent reader, Leah Nelson, noticed an extraordinary leaf on a sidewalk in Rogers, Arkansas—a giant sycamore leaf that was 16 ½ inches wide, and 13 ½ in. long, more than twice the normal size. 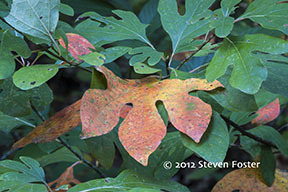 This fall at Black Bass Lake I found a small group of Sassafras trees with leaves that were far from normal. Usually Sassafras has three types of leaves— simple oval leaves, mitten-shaped leaves (with one prominent lobe), and three-lobed leaves. Sassafras leaves are “always” longer than wide. On these trees, a large percentage of leaves were 5-7-lobed, and up to three times as wide as long. Back in the early 80s I wrote about an Ozark Witch Hazel (Hamamelis vernalis) plant that I found that was brilliant scarlet red. It’s usually yellow to orange-tinged. A plant breeder in up-state New York saw my article and traveled to the Ozarks just to see the plant. He collected it, propagated it and offered it to his customers. These are examples of what horticultural breeders refer to as “sports”—variations from a plant’s “normal” morphological features. It’s all part of the package that nature delivers as endless variation. It is this endless variation that horticulturists exploit to bring unusual or new plants to gardens. The famous plant breeder, Luther Burbank (1849-1926), gave us the giant Idaho potato (the Russett-Burbank potato). Before that one could hold a handful of potatos. Inspired by Charles Darwin’s 1868 book The Variation of Animals and Plants under Domestication, Burbank planted dozens of acres of daisies, then walked up and down the rows, selecting a handful of “sports” from which to collect seed for propagation. The rest of the field was plowed under. From those selections the Shasta daisy was born. These types of variations usually are not described in field guides. They are freaks of nature, genetic twists of fate, or perhaps some inexplicable response to the environment. Who knows! We just hope that when we find such mutations that they are not induced by man-made chemicals unleashed to the air, soil, and water or from genetically modified organisms. Let Nature work her own wonders.